Standard VLC clamp is designed for vertical lifting and turning over of plates, the clamp possesses a safety device by which the lock is not disengaged even if the lifting rope is slackened. This clamp can be applied for a wide range of works which maintains a structure for safety against ground-touching shocks of the loads. 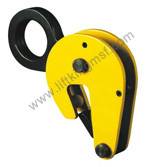 The Universal vertical PLC clamp is designed to ensure that the load can be lifted and turned (180°) . Whilst at the same time ensuring that the load is positively retained. 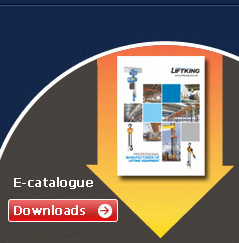 These clamps have a wide range of uses and are particularly suited for the lifting and turning of steel plates,ship sections and the extraction of pile sheets. 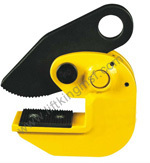 Fitted with a hinged hoisting eye moving in all directions so as to enable the user to place and lift the load from any directions. 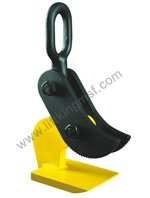 Clamps are fitted with special hook-up facilities to enable easy fitment of the clamp in horizontal position.